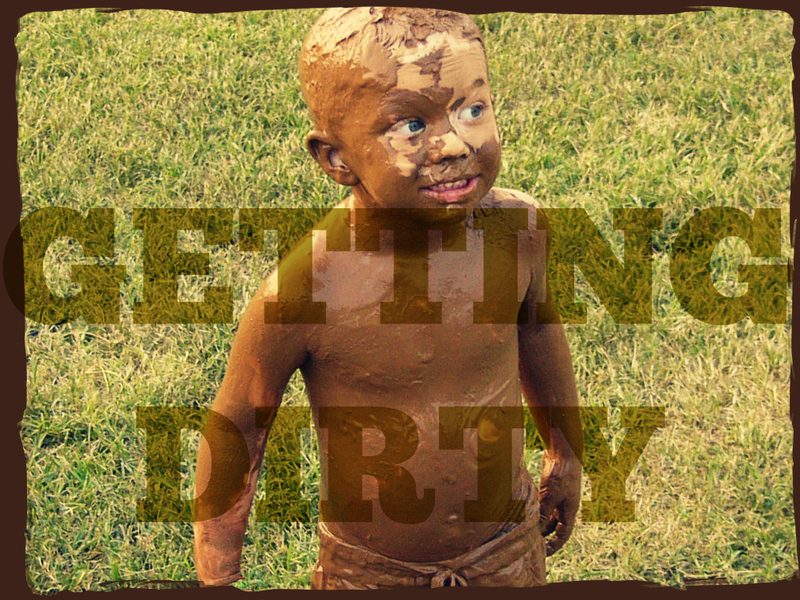 Relate: Getting dirty is a right of passage for kids. If a parent sends their eight year old out to play and they come back two hours later not covered in dirt, then there is probably cause for concern. Getting down in the ground, experimenting with the combination of water and dirt, seeing what kinds of bugs live under which rocks… this is all natural and good and healthy. Somewhere along the way, most of us grow out of it. If I get dirt on my knees today, that’s no big deal, but at the first opportunity I will be putting on a different pair of pants. Thirty years ago I wouldn’t even have noticed it. If would have to be reminded, begged, pleaded, and cajoled before switching into new clothes and you could probably count the minutes on one hand before that new set had its own grass and dirt on my knees or bum. Now… not a chance. The fact that I have been buying my own clothes and doing my own laundry for the past couple decades helps, but is is mostly society’s conditioning that has helped me get beyond having dirty be my default setting. Today I am too proud to get dirty without good cause or stay dirty any longer than necessary. That Duck Dynasty stuff just isn’t my thing. React: I think it would be a safe bet to say that when I first heard the story of how Jesus healed the blind man my thoughts were something along the lines of, “That’s cool. I wonder if I tried something like that, could I heal a blind person?” I never actually did it but it wouldn’t have been out of character for me to try and rub some spit created mud into the eyes of one of my friends who had to wear glasses. Their willing agreement to such a scheme would not have been necessary, chasing them down would have been half the fun. Today… not a chance. There is a natural revulsion even to my trying to picture Jesus doing this to the blind man. If my mind’s eye even rebels against the thought, how much more so would those whose physical eyes were looking on? How much faith did that blind man have to allow this stranger to rub muddy spittle into his eyes? How desperate was he for a healing that he would stoop that low? How much humility was required? How much pride had to be conquered? There are areas in all of our lives that need healing. It might be spiritual issues. It might be memories or habits or perhaps skills that need to be unlearned. Maybe there are physical issues in our lives that God is waiting for us to ask for healing. I had grown used to my asthma but now that He has healed me I can’t imagine getting it back. Are we getting used to these deficiencies, hurts, and lacks in our lives? Are we as desperate for God’s healing hand as we should be? Does pride stand in the way of God moving in our life? Would I be willing to let God slap some spit and mud in my eye? God, I come to You confessing my sin of pride. I confess that I have made my world and my life too much of a sterile environment. I confess that my need to keep everything neat and tidy has stifled opportunities for You to move in and through me. Help me to come back to You with a childlike wonder. Help me to smile in awe rather than shudder in revulsion when the way You move runs against the cultural taboos that have infiltrated my sense of what is right and wrong. Help me to have a humility and trust that would openly embrace even the “mud” that You might throw my way. I want You to be glorified in my life, even if that means I need to bend down and get a little dirty. Thank you, BJ, for this.